How do you like your pizza? Well I do enjoy the company of thick crusted pizzas, but nothing keeps my heart rate rising than a slice of thin crispy mouth-watering pizzas! And Greenwich has got it so right this time. Rich with toppings and a crisp thin crust, so thin you have have more of the flavor. 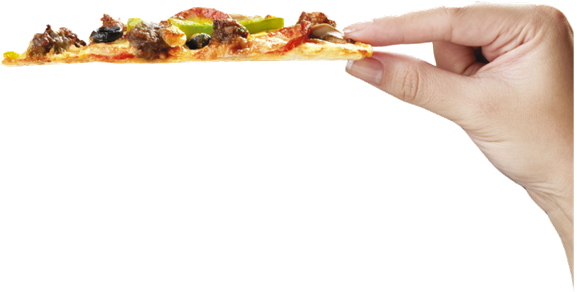 Most thin pizzas today become soggy over a short period of time and some are even too oily, spoiling the appetite. Welcome Greenwich's new Pizza Thins, a delightful addition to the Greenwich menu touted to tickle your taste buds. You'll know how thin and crisp it is with just one single bite. Using only high quality ingredients to ensure consistency, and maintains you pizza to be crisp to the last bite. It's always a pleasure to enjoy great tasting Chinese dishes prepared by master chefs all around the world, and luckily we have quite a few of the best chefs here in Gloria Maris Greenhills. Gloria Maris has been part of our daily lives for the past decade or so, from their previous location in Greenhills, their picturesque branch at the CCP grounds and now their latest opened restaurant with their newly built restaurant, housing their dimsum area, their shabu-shabu area, their ala-carte place, their banquet section and their very private VIP section. Gloria Maris Greenhills has up the ante in serving us Chinese cuisines of the highest standards, combining art, style and a taste truly Gloria Maris. Enough has been said about who indeed is the best Katsu in town, but words are just mere instruments and only our sense of taste can finally say, they indeed are the best. The Katsu craze is now upon us as the Ramen race is still transpiring, to most of us they are just fried meat with breading and crumbs, but what we don't know is the skill and expertise one has to muster to get that perfect Katsu, thus enter Ginza Bairin. In 1927 from humble beginnings, the first ever pork cutlet store in Ginza district, made its way to the hearts of the locals, and up to now has opened stores in Hawaii, Singapore, Hong Kong, Seoul, China and finally it has found its home in Philippines, Ginza Bairan in Glorietta 2, Makati. Surprise! It's Derek on Dunkin' Donuts Day! 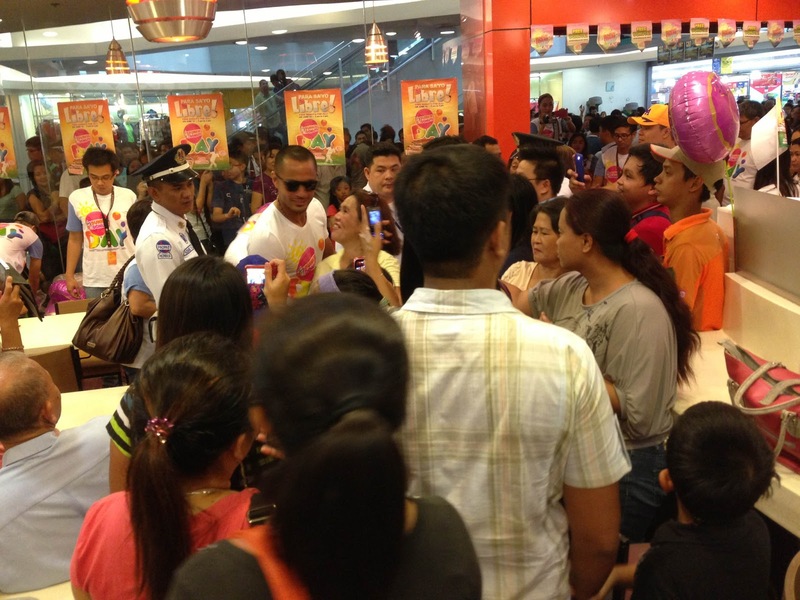 Derek Ramsay, in celebration of the 10th Dunkin’ Donuts Day toured the metro's Dunkin' Donut stores and surprised fans of the beloved donut and coffee franchise. Stopping by branches at SM North EDSA, SM Megamall, and Greenhills Shopping Center, Dunkin’ Donuts fans lined up for a taste inspired by D’s Favorite – a special combination of Ramsay’s favorite donuts, Boston Kreme and Strawberry Filled. Aside from the meet and greet with the actor, free donuts, and balloons, Dunkin’ Donuts fans also had a chance to avail of a one-day only promo of two dozen donuts for only P299. So, how did Dunkin’ Donuts Day go for you? Share it with us and follow Dunkin Donuts on Facebook and @dunkinph on Twitter. 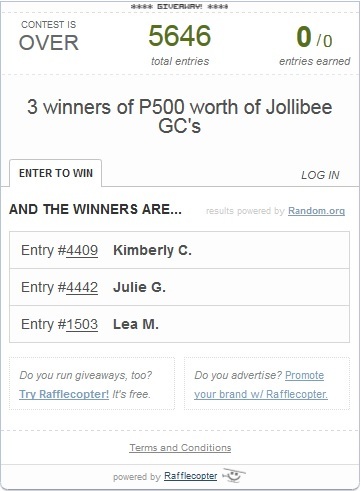 Each of our winners will receive P500 worth of Jollibee GC's, we would like to extend a big thanks to Jollibee for sponsoring this giveaway, and a big thanks as well to all of you, my readers for supporting The Food Alphabet and More. Please expect an email from me on how you could claim your prize. 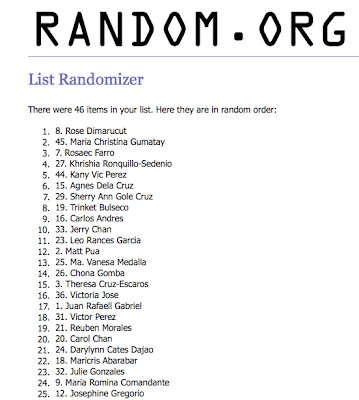 Thank you all for joining this giveaway. Keep on visiting us regularly to be updated of new food finds, great food promos and a gastronomic experience surely to tease your tummies. More giveaways coming up! Get to enjoy buffets from Corniche, unlimited yakiniku at Yurakuen, tempting desserts at The Cake Club, sumptuous treats at the Lobby Lounge at 50% off for the whole week of July 15 - 21. Get to enjoy these treats starting today! 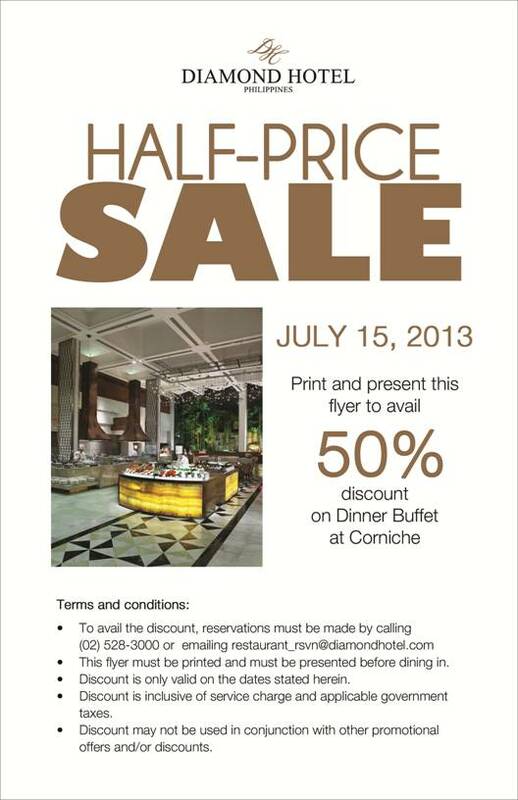 Just print the voucher below and enjoy. Thank you Diamond Hotel and Enjoy guys! On July 16, 2013, Starbucks Coffee will be taking you to a whole new coffee experience you will once again fall in love with. Presenting a white chocolaty twist, the Dark Mocha White Chocolate Pudding Frappuccino Blended beverage and Green Tea White Chocolate Pudding Frappuccino Blended beverage. Starbucks continues on their strive to give us that unique coffee experience, the White Chocolate Pudding Dark Mocha Frappuccino Blended beverage is a chocolate lovers delight. Mixing in that deep flavor of dark chocolate, velvety smooth chocolate pudding, Starbucks signature Frappuccino Roast coffee, chocolate chips and milk blended ice topped with whipped cream and chocolate powder. Order it in Tall - P190, Grande - P200 or Venti - P220 and enjoy the rich goodness of this treat. 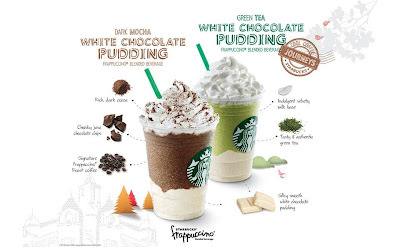 For me, I just love Dark Mocha White Chocolate Pudding Frappuccino, it's like having 3 chocolates in one cup! From the white chocolate pudding, the chocolate chips and rich dark cocoa, it just fulfills every chocolate lover's dream, and that's me! 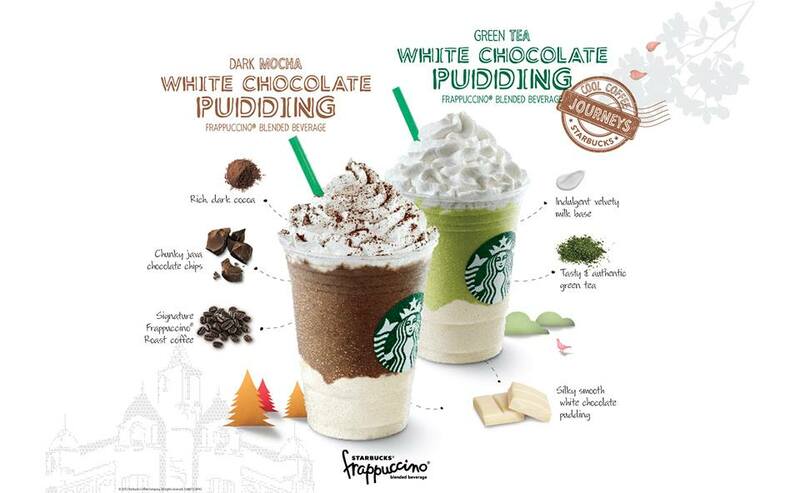 Want to try the white chocolate pudding on your regular favorite Starbucks Frappuccino blended beverage? Of course you can order it, just ask for it from your barista and they will grant your wish. Fiesta Bahia is coming to SM Mall of Asia! Mercato Centrale, the country's premiere and most successful weekend market in the metro is giving all out! After much success in Soderno, Cocina Centrale and Mezza Norte, you would thought they would stop at that, but they have once again exceeded everyone's expectations! And now they are bring Food Tourism to the next level. Did you know that one of top tourist destinations in Manila is the SM Mall of Asia (MOA)? And what’s one of the best ways to welcome foreign guests to one of Manila’s top tourist destinations? By sharing with them a variety of great-tasting dishes from different parts of the Philippines! 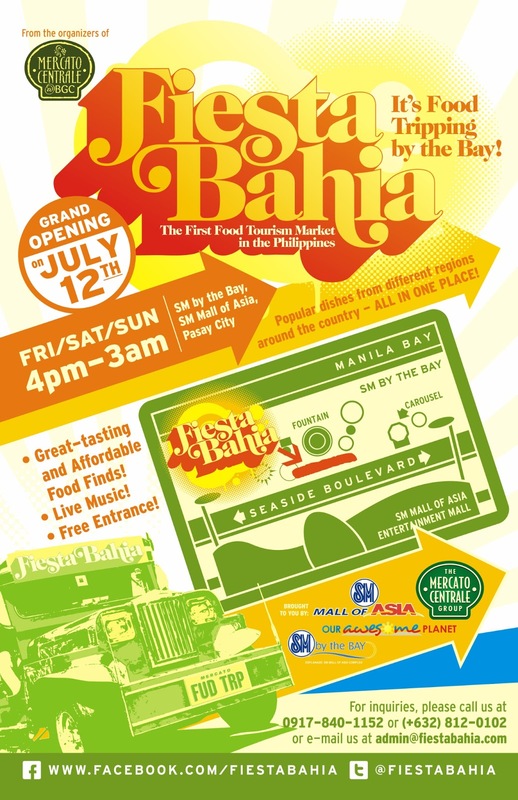 That’s why the Mercato Centrale group, is bringing a new ‘food destination’ experience to the SM Mall of Asia By the Bay with Fiesta Bahia – ‘the food tourism’ market – every Friday, Saturday and Sunday starting July 12 (Friday) from 4pm to 3am. 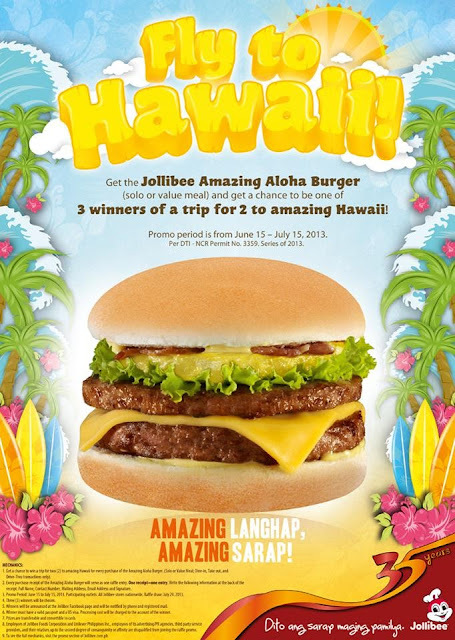 Fly to Hawaii with Jollibee's Amazing Aloha + Amazing GC Giveaway!!! Jollibee is bringing you to Hawaii! Yes, just purchase an Amazing Aloha, solo or value meal, fill up the back portion of the receipt to serve as your raffle entry. Please put your name, contact no., mailing address, email and signature. 1 receipt = 1 entry, a receipt containing more than 1 Amazing Aloha counts only as one entry. What's in store for you when you win? One amazing prize! 3 winners will win this great Hawaii getaway! 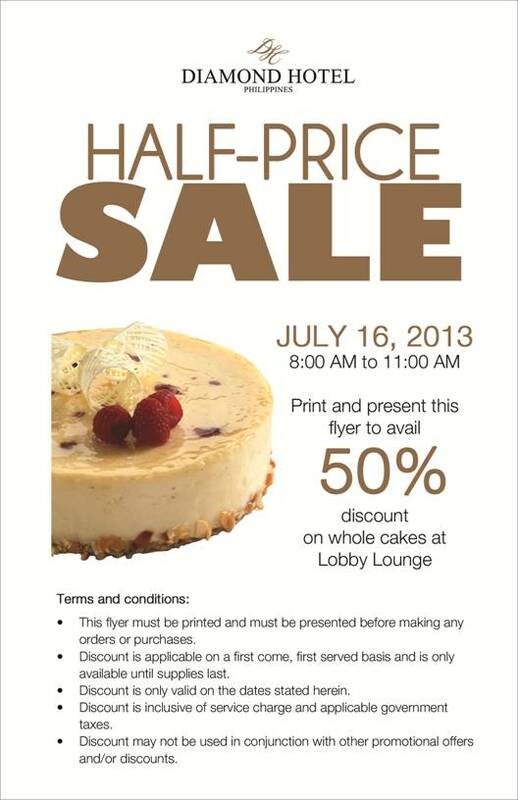 Joining is until July 15, 2013. But let's make this giveaway even sweeter. The Food Alphabet and Jollibee is giving away Jollibee GC's to 3 lucky readers! 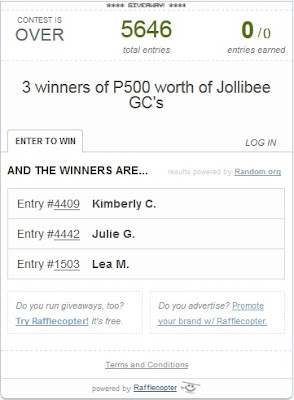 Each winner will get to win P500 worth of GC's to enjoy the langhap sarap goodness of Jollibee. So join in on our rafflecopter giveaway! Congratulations! You have just won P1,500 worth of T.G.I.Friday's GC's from The Food Alphabet! The correct answer to our questions was "Chicken Fingers". Please wait for an email coming from us on how you could get your P1,500 worth of T.G.I.Friday's GC's. Thank you so much to all who joined, more giveaways coming up! Hope you had a great 4th of July at T.G.I.Friday's and enjoyed that half-off on Chicken fingers at T.G.I.Friday's! 4th of July Treat! Guess the dish and win P1,500 GC from T.G.I.Friday's! We may be so far away from the United States, but they are just as much part of our everyday lives. It's the 4th of July and we are celebrating!!! To commemorate the 4th of July, Independence day of the USA also celebrated here as Filipino-American friendship day, T.G.I.Fridays and The Food Alphabet is giving away P1,500 GCs to 3 winners! How to win, it's easy! Just guess the dish and win! Guess what dish is being featured in the poster above, and you stand a chance to be 1 of 3 winners of P1,500 worth of T.G.I.Fridays GCs! Just do the following to join. 1.) Like The Food Alphabet on Facebook. 2.) Share this post on your Facebook page, by clicking on the "share" button on top, and copy this message and post on your timline. 3.) Please make sure to tag The Food Alphabet and 3 of your friends on the shared post for your entry to be valid. 4.) Post on the comments section below your answer as well as your complete name, email and the link to your Facebook post. 5.) One FB account, one entry only. Giveaway is on until July 5 at 12 midnight, well it's practically still the 4th of July in the US right? 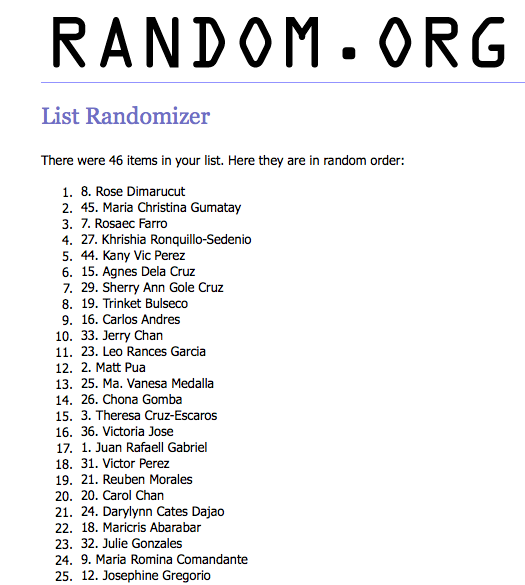 We will announce the winners the next day via random.org. Good luck everyone and have a great 4th of July! 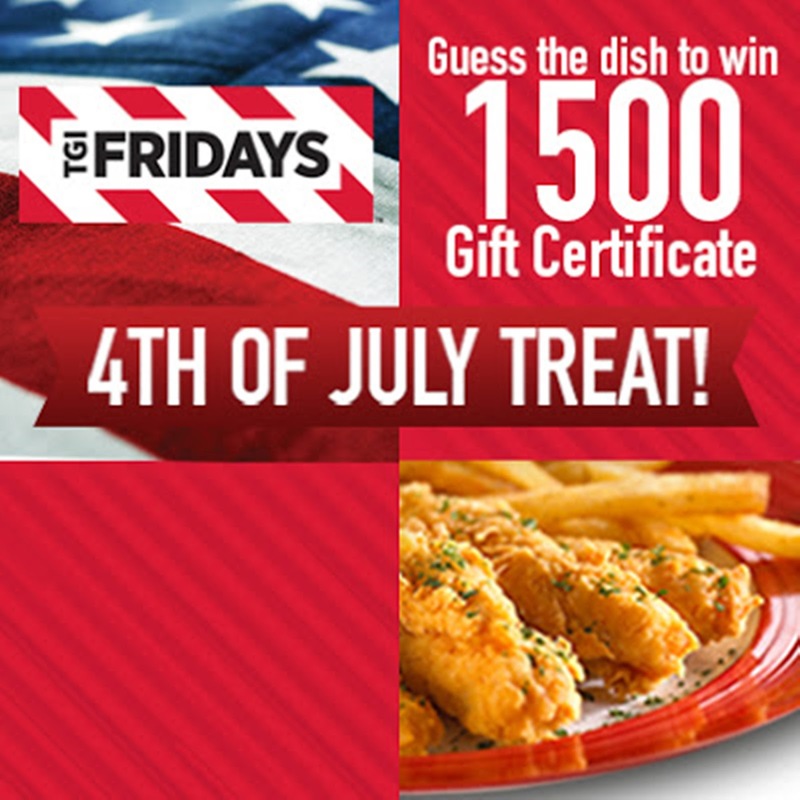 **Tip : The answer is...well it's what they will be serving in T.G.I.Fridays at half-off on the 4th of July! A blowout like no other. 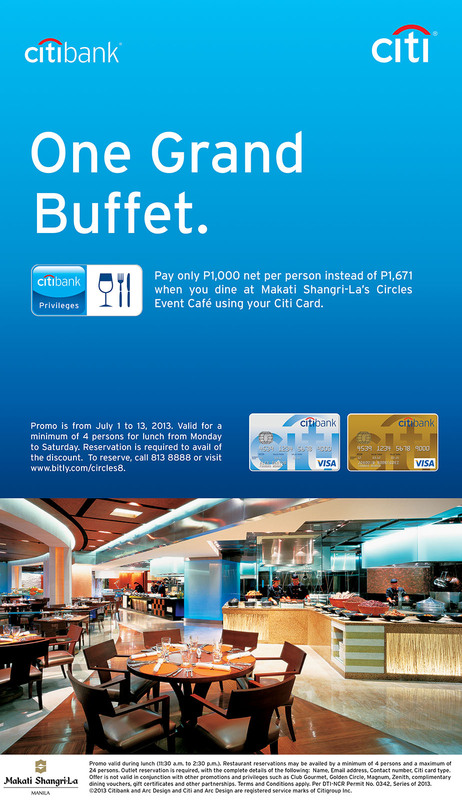 Get to enjoy Circles lunch buffet at Makati Shangri-La for only P1,000 nett per person when you book your table for a minimum of 4 guests in advance and pay with your Citi Card. Get to enjoy this lunch buffet offer only from July 1 to 13. Enjoy Circles’ wide selection of cold appetizers, seafood specialties, Western and Asian cuisine, and desserts at this special rate during lunchtime from Monday to Saturday.